American engineer mission specialist astronaut 1967-1984. Status: Deceased; Active 1967-1984. Born: 1939-03-14. Died: 2010-08-26. Spaceflights: 1 . Total time in space: 5.09 days. Birth Place: Miami, Florida. Educated MIT. Died in Sandoval County, New Mexico. PERSONAL DATA: Born on March 14, 1939, in Miami, Florida.Married to Terri Waite.Three grown children. Bill Lenoir died on August 26, 2010 from head injuries sustained during a bicycle accident. EDUCATION: Attended primary and secondary schools in Coral Gables, Florida; is a graduate of the Massachusetts Institute of Technology where he received a bachelor of science degree in electrical engineering in 1961, a master of science degree in 1962, and a doctor of philosophy degree in 1965. ORGANIZATIONS: Senior member of the Institute of Electrical and Electronics Engineers; and member of American Institute of Aeronautics and Astronautics, Eta Kappa Nu, and the Society of Sigma Xi. SPECIAL HONORS: Sloan Scholar at the Massachusetts Institute of Technology and winner of the Carleton E. Tucker Award for Teaching Excellence at MIT; awarded the NASA Exceptional Service Medal (1974), and NASA Space Flight Medal (1982). EXPERIENCE: From 1964 to 1965, Lenoir was an instructor at MIT; and in 1965, he was named assistant professor of electrical engineering. His work at MIT included teaching electromagnetic theory and systems theory as well as performing research in remote sensing. He was an investigator in several satellite experiments and continued research in this area while fulfilling his astronaut assignments. Lenoir is a registered professional engineer in Texas. He has logged over 3,000 hours of flying time in jet aircraft. NASA EXPERIENCE: Dr. Lenoir was selected as a scientist-astronaut by NASA in August 1967. He completed the initial academic training and a 53-week course in flight training at Laughlin Air Force Base, Texas. Lenoir was backup science-pilot for Skylab 3 and Skylab 4, the second and third manned missions in the Skylab Program. 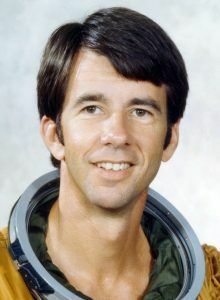 During Skylab 4, he was co-leader of the visual observations project and coordinator between the flight crew and the principal investigators for the solar science experiments. From September 1974 to July 1976, Lenoir spent approximately one-half of his time as leader of the NASA Satellite Power Team. This team was formed to investigate the potential of large-scale satellite power systems for terrestrial utility consumption and to make program recommendations to NASA Headquarters. Lenoir supported the Space Shuttle program in the areas of orbit operations, training, extravehicular activity, and payload deployment and retrieval. Dr. Lenoir flew as a mission specialist on the STS-5 (November 11-16, 1982, the first flight to deploy commercial satellites, and has logged over 122 hours in space. 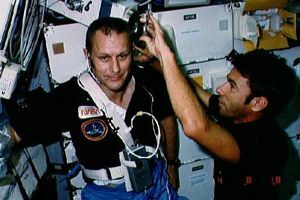 Following STS-5, Dr. Lenoir was responsible for the direction and management of mission development within the Astronaut Office. Dr. Lenoir resigned from NASA in September 1984, to assume a position with the management and technology consulting firm of Booz, Allen & Hamilton, Inc. in Arlington, Virginia. He returned to NASA in June 1989 as the Associate Administrator for Space Flight, responsible for the development, operating and implementation of the necessary policy for the Space Shuttle and all U.S. government civil launch activities. Dr. Lenoir resigned from NASA in April 1992, to assume the position of Vice President of the Applied Systems Division at Booz, Allen & Hamilton, Inc. in Bethesda, Maryland. SPACE FLIGHT EXPERIENCE: STS-5 Columbia launched from Kennedy Space Center, Florida, on November 11, 1982. This was the first operational flight of the Spaceship Columbia and became known as the "We Deliver" mission. Two commercial communications satellites with Payload Assist Module upper stages (PAM-D) were successfully deployed from the Orbiter's cargo bay, a new first. This activity was shared with the world when the onboard television tape was played to the control center later that evening. In addition to collecting precise data to document the Shuttle's performance during launch, boost, orbit, atmospheric entry and landing phases, STS-5 carried a Getaway Special experiment, three Student Involvement Project experiments, and medical experiments. STS-5 was the last flight to carry the Development Flight Instrumentation (DFI) package to support flight testing. The STS-5 crew successfully concluded the 5-day orbital flight of Columbia with the first entry and landing through a cloud deck to a hard-surface runway, demonstrating maximum braking. STS-5 completed 81 orbits of the Earth before landing at Edwards Air Force Base, California, on November 16, 1982. PERSONAL DATA: Born on March 14, 1939, in Miami, Florida. Divorced. Two grown children. Recreational interests include sailing, wood-working, and outdoor activities. Family: Astronaut. Country: USA. Spacecraft: Skylab. Flights: Skylab 3, Skylab 4, Skylab 5, STS-5. Projects: STS. Bibliography: 12, 5682. 1939 March 14 - . Birth of Dr William Benjamin 'Bill' Lenoir - . Nation: USA. Related Persons: Lenoir. American engineer mission specialist astronaut 1967-1984. 1 spaceflight, 5.1 days in space. Flew to orbit on STS-5 (1982)..
2010 August 26 - . Death of William Benjamin 'Bill' Lenoir. - . Related Persons: Lenoir. American engineer mission specialist astronaut 1967-1984. 1 spaceflight, 5.1 days in space. Flew to orbit on STS-5 (1982)..